$1,500,000 Rare Find, Titled Beachfront Property! "Rare Find, Titled Beachfront Property on a secluded beach." Address: Luxurious & Modern Beachfront home, 5 bedrooms, 5.5 baths, w/ Private pool and more! 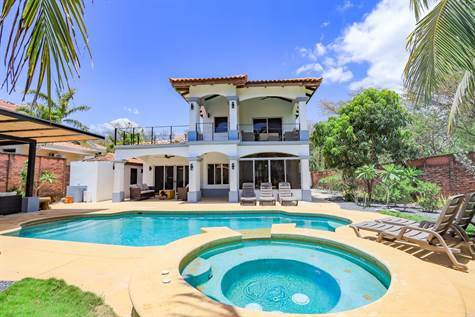 Year Built: 2006 "Remodeled in 2015 and 2017"
Welcome to Casa Tres Cocos, a slice of paradise right on the beachfront, this very beautiful, 5 bedroom home, with a beautiful garden, and spacious pool is now for sale. You will enjoy amazing sunsets everyday over the Pacific from the privacy of your own backyard. The house has 3 master suites., the one upstairs has a spacious ocean view balcony. Located on a very private cul-de-sac on the beach with only 5 other homes. The beach is immaculate and never gets crowded. The main house offers a spacious master suite upstairs with a walk-in closet and a private balcony which overlooks the pool and to the ocean through the trees. The downstairs has two guest bedrooms that share a bath, as well as another master suite with private bath. The bathrooms, downstairs have a garden shower which let in lots of natural light and is an amazing bathing experience. There's a beautiful kitchen with top of the line stainless steel appliances, custom wood cabinets, and gorgeous granite and tile finishes. The dining room is large with a custom-built dining table for 10. The living room is very spacious and the house has air conditioning throughout. On the other side of the pool is another master suite with a private entrance and a spacious private bathroom. The outdoor space on the property is very tropical and offers large covered areas for relaxing by the pool in the shade. The pool is very spacious, good for swimming laps, or playing with the whole family, and it also has a cool water jacuzzi with massage jets. The property comes with an electric gate for secured off street parking, and a privacy wall around the property. The location is on the beach just north of Playa Grande, called Playa Ventanas, here there are only 6 homes, and the beach is never crowded. There is white sand and tropical palm trees, making it a true paradise setting. The property is just a short drive or bike ride from the town of Playa Grande where there are over 13 great restaurants to choose from, as well as a health and dental clinic and several surf shops. The surfing in Playa Grande is world renown. The international airport in Liberia is just 1 hour from the house. The property is currently used as a vacation rental during the times when the owners aren't using it themselves, and it has proven to be a very good investment and has over 70% occupancy throughout the year, and rents on average from $600 to $1000 per night. Inquire today for more information about this one of a kind titled beachfront property.